Acknowledged author Mary Ellen Guffey wrote Business Communication: Process & Product comprising 1056 pages back in 2017. Textbook and etextbook are published under ISBN 1305957962 and 9781305957961. 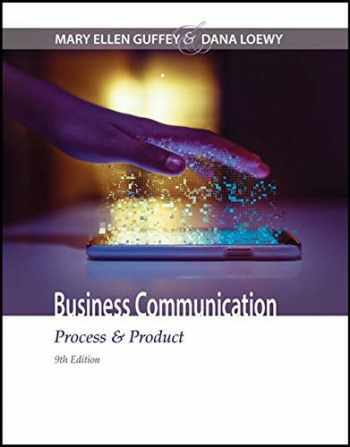 Since then Business Communication: Process & Product textbook received total rating of 4 stars and was available to sell back to BooksRun online for the top buyback price of $74.60 or rent at the marketplace. Let BUSINESS COMMUNICATION: PROCESS AND PRODUCT, 9E prepare you for success in today's digital workplace. This leading textbook and vast digital resources help you develop the communication competencies that employers value most, such as superior writing, speaking, presentation, critical thinking, and teamwork skills. Two thoroughly updated employment chapters offer tips to prepare you for a labor market that is more competitive, more mobile, and more dependent on technology than ever before. Authors Mary Ellen Guffey and Dana Loewy have interviewed practitioners as well as researched hundreds of articles and blogs to capture the latest trends, technologies, and practices for the most up-to-date advice on how to ace the job search, resumes, cover letters, interviews, and follow-up activities. Optional grammar reviews in each chapter, including a complete grammar guide in the end-of-book appendix, help you improve critical English language skills.